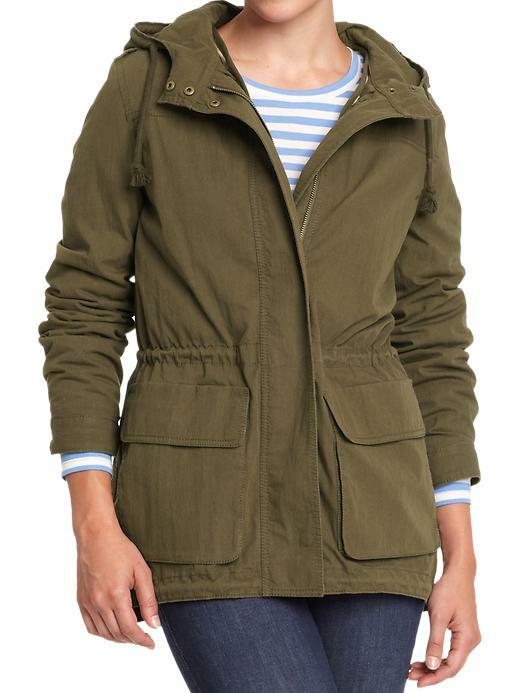 This Old Navy jacket has just moved up to #1 on my current Must Haves. I guarantee you'll feel the same way and not just about the $49 price tag! The hooded anorak comes in 5 colors (black, emerald, oatmeal, orange and army green) which means options for everyone! The hood is detachable making it easy to take on or off when it's needed. I love the drawstring waist which not only provides a fabulous fit, but also ensures you won't have a shapeless figure. And that's not even my favorite part! There's a removeable insulated vest which keeps your body warm and toasty on cold winter days, and completely take out for mild fall weather. Another nice bonus is that the additional lining isn't super bulky like other insulated pieces can be. Can you believe you get all of this for $49?! I beelined straight for the Army Green yesterday and tried on an XS. Definitely too tight - especially if you'll be wearing layers underneath. Our store only had XL's so I'll be ordering this one online. Luckily, Old Navy is having a promo right now - $15 off when you spend $75! Use the code ONFALL15 until 10/14. Can't wait to see if you grab it! This is a great suggestion. I like it. Love this! Might need it in black!